Göran Persson is Partner in GreenGold and is exclusive for GreenGold in every regards concerning Timberland investment space globally. His work will be focused on Europe – but his network and competence is global. 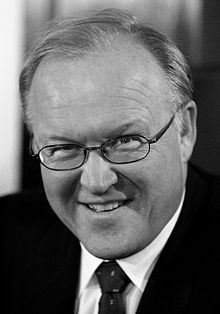 Göran has been education minister and finance minister of Sweden under several yrs and ending by being prime-minister of Sweden during 10 yrs (1996-2006). Since 2008 he was appointed by the Swedish Government as Chairman of Sveaskog Company (Swedish state owned forest co, owns and manages 4 million hectares forest in Sweden, the largest European forest co), position from which he resigned in June 2015 and joined GreenGold in July 2015. Göran has been a member of the European Council on Tolerance and Reconciliation since 2007, and a member of the board of World Resources Institute since 2010 (dealing among others with very large reforestation projects globally). Since 2012, Göran is also leading the high-level discussion and information-sharing forum on the future of European forests (ThinkForest) hosted by the European Forest Institute. Göran is also Chairman of the Swedish Private Equity company Pegroco Invest AB and is Director in the Board of The Bank of Åland. Göran is today a fully self-sustained entrepreneur; he owns and lives on a forest & agri farm near Stockholm, so he has solid hands-on experience in managing, developing and trading forest & agri properties. Fluent in English and Swedish.